The Quran (English pronunciation: /kɔrˈɑːn/) (Arabic: القرآن‎), literally meaning “the recitation”. Qur’an or Quran is the last revealed word of God (Allah), is the primary source of every Muslim’s faith and practice. The Quran was verbally revealed by Allah to Prophet Muhammad (PBUH) through the angel Gabriel, gradually over a period of 23 years. The Quran is the only revealed book that has been protected by Allah from distortion or corruption. God determined a kind of miracle for each prophet and the miracle of the prophet MUhammad (PBUH) is Quran. It deals with all the subjects that concern human beings, wisdom, doctrine, worship, science, life style, instructive stories, the story of the other prophets, woman, law, transactions, etc., but its basic theme is the relationship between God and His creatures. At the same time, it provides guidelines and detailed teachings for a just society, proper human conduct, and an equitable economic system. Note that the Quran was revealed to Prophet Muhammad (PBUH) in Arabic only, So, any Quranic translation, either in English or any other language, is neither the original Quran, nor a version of the Quran, but rather it is only a translation of the meaning of the Quran. 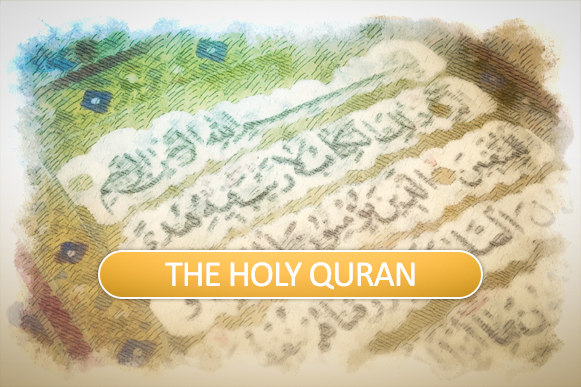 How the holy Quran is revealed? Prophet Muhammad (PBUH) was elected by God to be the last prophet, as it was prophesied in other Abrahamic books. After 3 years, in Ramadan month, at the night of Qadr, when prophet Muhammad (PBUH) was praying in Hira cave (near Mecca) while he had stayed there for several days and nights, Gabriel revealed to him and God revealed Quran by this great angle to Prophet Muhammad (PBUH). Quran is sent to the prophet during 23 years, gradually. … Surely, therein is a sign for you, if you indeed are believers. Limitation of each Surah and Aye is determined by the prophet Muhammad (PBUH) and he had put them in a row according to the date of revelation. Quran is divided into 114 Surah. It is quoted from Ibn Abbas that this was the last Aye that revealed to the prophet and he put that after the Aye 280 of Surah Al-Baqarah by the order of Gabriel. The first complete Surah that was revealed was Fatiha and the last complete Surah was Al-Nasr. The shortest Aye is “مُدْهامَّتانِ” (Surah Al Rahman, verse 64) and the longest is 282 of Al-Baqarah which contains more than 30 terms. Each Surah begins with بسم الله الرحمن الرحيم (in the name of Allah) except Surah Al-Toubeh. Surah Al-Naml has 2 “بسم الله الرحمن الرحيم” , one of them is for the beginning and the other related to the prophet Solomon’s letter which had written for Bilqis, the queen of Sheba, and his letter have been began by “بسم الله الرحمن الرحيم”. The shortest Surah is Al-Kowthar with 3 verses and the longest Surah is Al-Baqarah with 286 verses. Verse 15 of Surah Al-Sajdah, verse 37 Surah Fussilat, verse 62 Surah Al-Najm, and verse 19 Surah Al-Alaq. These 4 Surahs are named Aza’em and if anyone read or listens to these verses, it is compulsion to prostrate after finishing the verse, right away. Verses and Surahs of Quran are divided into main category, Makki (take place in Mecca) and Madani (take place in Medina). This division helps researches more and better. As it is said before, Quran is revealed during 23 years, through about 13 years of the prophet’s life, in Mecca and the rest in Medina. Quran is like sea. Ordinary people watch the outside of the sea and they enjoy it. Even people who cannot swim, stay in the shore and enjoy watching and listening the sea. But people, who can swim, go into the deep like divers and just divers are the people who discover unique and worth full things. In the most Surahs, Quran wants people to think to verses and get the valuable points of them because Quran is the last guideline book that is sent to the last prophet for all people in the whole world. Quran is a book that can be interpreted in all centuries, clearly and it is just one of the miracles of Quran. This guideline book proves its divinity by itself, so it cannot be written by a human. By looking at the articles you will find some articles about the miracles of the Quran. Someone told me Quran revealed on 27 days. can you tell me more about this. Revealing of Quran was gradually. According to Quran, Surah “Qadr” and according to Ahl Al-Bayt’s narratives, revealing began on 27th of Ramadan after Muhammad (pbuh) had been elected as a prophet, at age 40. It lasted until his martyrdom, when he was at age 63. So, Quran revealed during 23 years.